Are Race Entry Fees Too High? If you’ve registered for a race recently, you may have been suprised by the entry fee. Even a low-key 5K race can cost $30, and many marathons have entry fees of $100 or more. If you only race occasionally, then these fees probably aren’t a big deal, but for those who race a few times a month, the entry fees can really add up. What does your entry fee buy you? What determines the cost of producing a race? Have the costs increased significantly in recent years? Race sponsors can alter the economics by contributing cash in exchange for naming or advertising rights, or by contributing non-cash assistance, such as stocking aid stations or furnishing T-shirts and prizes. It’s interesting to compare a race entry fee with the price of ski lift ticket, since they have many costs in common. A marathon costs about the same as a typical lift ticket, but the ski operator has the advantage of spreading its cost of insurance, permits, staff, and emergency services over an entire winter, while the marathon must recover its expenses from a one-time event. Furthermore, no ski area gives you a T-shirt and a medal at the end of the day. Of course the marathon doesn’t need to maintain snow making and snow grooming equipment, so it’s an imperfect comparison, but by this measure the cost of a typical marathon appears quite reasonable. In the final tally, the entry fees plus sponsor assistance must do more than simply cover the race’s expenses. Every race wants to generate a profit, whether because it’s operated by a for-profit event promoter, or is a charity event whose profits will go to an organization like Race for the Cure. Over the past five to ten years, have race entry fees have increased faster than inflation or other cost of living measures? It’s easily to grumble about the cost of races while forking over $40 for the latest 10K, but have costs truly increased at an unreasonable rate? To answer that question, I took a look at some of my own races from the past nine years, and compared the original entry fee to the current entry fee for the same or similar race. All 2011-2012 fees reflect the lowest possible early entry fee, and do not include online registration convenience charges or other surcharges. All original race fees are from my records of what I actually paid, and may or may not reflect early entry discounts or online registration convenience fees. For shorter races between 5K and 10K, most of the earlier races no longer exist. Instead, I compared a sample of earlier races with current races of similar distance, size, and location. The longer races saw entry fees increase by an average of 34% over a six to ten year period. That sounds like a lot, but it’s the equivalent of only about 4% increase per year. While that’s a faster rate of increase than most other expenses over the same period, it’s not an unreasonable rate. One expense that has increased over this period is the widespread adoptance of online registration “processing fees”. Ten years ago, most race registrations were made by mailing in a form, and the race entry fee was all that was paid. Today there’s often an additional $5 fee when registering online, beyond the race entry fee itself. For more expensive races like triathlons, the processing fee can sometimes be $10 or more. Yes, the sign-up service must get paid too, but I find it hard to believe that automated processing of an electronic registration should be more expensive than paying someone to tear open envelopes and transcribe information from hand-written registration forms. Returning to the original question, if race entry fees appear justified, then what’s the frugal runner to do? 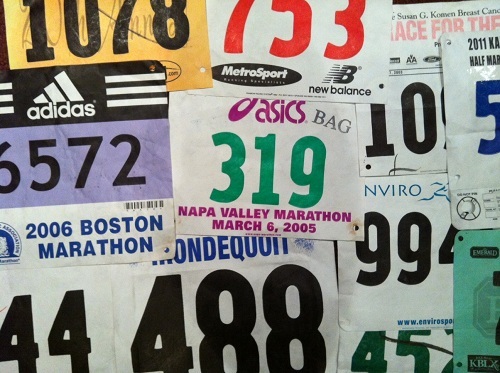 How can an active 5K racer avoid racking up a hundred dollars a month in entry fees? Racing as a bandit without paying the entry fee is definitely not a solution. While some people may find ways to rationalize banditing, or claim that they shouldn’t have to pay to run on public streets and trails, it’s an ethically bankrupt practice. Some races have begun offering a “no shirt” registration option, which knocks about $10 off the entry fee. For runners who already have a whole closet full of race T-shirts, this is a great option. Unfortunately the choice is not often offered. The best way to minimize entry fees is to seek out smaller events in out of the way locations. It might seem that events with 10000 runners would offer cheaper entry, thanks to their ability to spread fixed costs over more entrants, but this is rarely the case. The greater costs of permits, police, and emergency services combine with the added glitz of larger events to drive their costs higher. Of the four marathons mentioned above, it’s no accident that the ones in Iowa and rural New York State are far cheaper than those in Austin and Boston. In the San Francisco area, the Dolphin South End club puts on races nearly every weekend, with an entry fee of just $5. Races are held in San Francisco or other nearby towns, with distances from 1 mile to 12K, and may attract anywhere from a few dozen to a few hundred runners. For the frequent racer on a budget, it’s just what’s needed. I wrote this article two years ago, but the concerns about rising race fees are even bigger today.